Lister Gardens01297 445175work GardenDuring the huge stabilisation works in the town during the two years of 2006/7, the public gardens were completely destroyed. At the end of the summer of 2005 all the bats' nesting sites were sealed to stop them returning as the work started. Also, over 2,000 slow-worms were caught and rehoused, and a fifteen-centimetre barrier was placed around the gardens to stop any coming back. At the height of the works there was not a single tree, bush or blade of grass to be seen. It looked, from a distance, like an open cast mine of dark blue lias clay. The new planting, particularly towards the rear of the gardens, was designed to help bring the wild life back in and included a section of "set aside". Low shrubs were planted for cover, with grasses and seed bearing plants for food. It has been very successful. There are more birds in the gardens than ever before. Bat boxes and bird boxes have been put up in the trees and are already showing signs of being colonised. Because of the variety of plants, moths are on the increase, including the spectacular Jersey Tiger Moth. For garden lovers Langmoor and Lister are a must. Who says “You can’t grow anything by the seaside”? For everyone who loved the crazy golf, a newly designed one is back as are the putting green and the table tennis. The new woodland boardwalk offers probably the best views in the whole of Lyme Regis, with seating placed for people who like a little quiet contemplation. 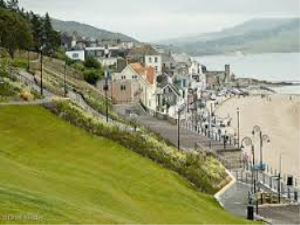 Lyme’s fabulous seafront gardens have received an accolade at the highest level, winning a prestigious national award. The redesigned and artistically developed Lister and Langmoor Gardens saw off major competition, including an entry from Heathrow’s Terminal Five, to lift the British Association of Landscape Industries award. The recognition of the gardens is a well deserved boost for the district and town councils and many volunteers who combined magnificently to turn a problem into a triumph when the project was included in the essential coast protection scheme. During the huge stabilisation works in the town during the two years of 2006/7, the public gardens were completely destroyed. To complete the seafront works, the two councils worked together between 2006 and 2011 to restore the Marine Parade Shelters immediately below the gardens, a task that had to wait until stabilisation was complete. This important structure has been transformed into an attractive and busy facility for visitors and residents.